I love rhyming books, especially when it can hold my interest as well as my kids too. I also enjoy books for the kids when they can learn in a fun and colorful way and this book makes that happen. 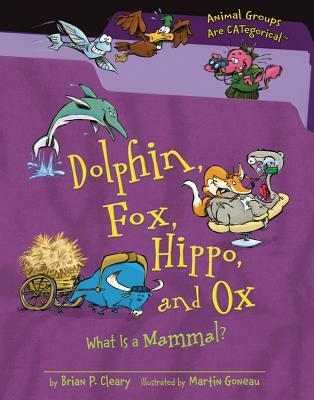 Mr. Cleary did a wonderful job of explaining the different reasons mammals are mammals and even took into account some of those unique mammals that don't always follow the rules making it easier to understand for a young child as well as upper elementary school too. The illustrations are pretty awesome too! My four year old was laughing at the pictures as he was learning all about how to classify lions, bats, whales, and even a happy platypus. There is a lot of visual stimulation throughout the book so make sure not to let the kiddos get confused. We just took our time enjoying the different pictures and tried naming even more animals that weren't in the book to see if they applied to the "mammal rules." I enjoyed this book immensely for many reasons. We learned while having fun but most importantly; this is a book that all four of my sons, from the 4 year old all the way to the 9 year old, could enjoy together. I gave it four **** stars! *clicking on title will take you to goodreads page; clicking on author's name will take you to a wonderful interactive website for extra activities and fun. Source: received from the author for our honest opinion of it. This is a interesting story that mixes the two genres of fantasy and science fiction to create a great adventure for middle grade students. Ethan Fox is a wonderful protagonist in this story. He is smart, funny, a good kid in general, and has a pretty cool family, including his dad that makes video games. And then we have Haley Hunt, who is the mysterious girl that just shows up in Ethan's life. She is definitely an enigma. She seems like she is much more but has no memory of where she comes from, just like Ethan's foggy past too. But Ethan and Haley seem to draw strength from each other, which makes their friendship even more special. This story takes an unique perspective on the idea of evolution including the idea of an advanced race having a hand in this process. These characters are called The Caretakers which seems like such a fitting name since they seem to take care of the inhabitants of Earth as well as the magical beings here too. We have so many different fantastical creatures including vampires. There are parts that tend to drag a little but it seems to balance out with all the amazing creatures we get to meet in this story. There were parts that made me think of Harry Potter's world, but Wolfe takes these similarities and puts his own creative spin on it. He creates a brand new fantasy world that I can't wait to see what else happens in it. This was a really cool book! 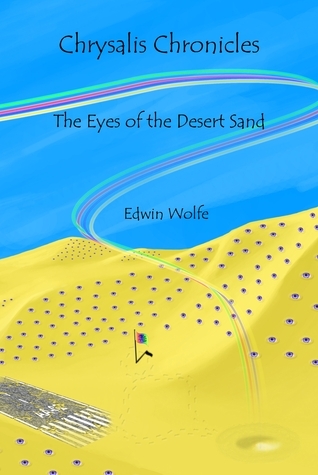 I liked the cover with all the eyes on the sand. It was a little freaky but really neat too! I loved the fact it had vampires in it but it was still a kids' book. Ethan is a pretty cool guy and his dad makes videogames. That is a really big plus for me! The Grimleavers were scary but exciting, especially when they tried to kidnap Ethan. Haley was pretty cool too. She seemed like a really good friend and helped Ethan make sense of these new environments he travels to with the Caretakers. RGB was really funny. I liked them a lot. I think kids 9 and up could enjoy and get into this book really good. Haley and Ethan are great characters to follow through this adventurous story about beings from outer space watching over Earth and all of its creatures. The Grimleavers are the bad guys that keep trying to kidnap Ethan and they have vampires. How freaky is that? While I was reading this, it made me think of Star Trek(I have watched it with my Nana a couple of times) especially when Haley and Ethan find the hidden room in the garden with Daavic's help. That was really cool! I am still not sure why Haley and Ethan was so scared of The Hall of Doorways, unless they were afraid of getting lost. Personally, I think it would be fun to play hide and seek in there. I really liked Mrs. Moongarden too. She reminded me of my Nana working in her garden, except Mrs. Moongarden's creations in the garden were a lot more cooler! I have to give this story four stars and I can't wait to read other books by Mr. Wolfe. Mom: When Haley and Ethan visit Mrs. Moongarden and learn everything about the plants in it. Those were some very interesting trees and flowers. Anthony: I liked the whole book! I didn't really have a favorite part because it all rocked! Conner: Me too! Though, I do like how the Caretakers travel with the portal books. I sure do wish I could get one of those! We give The Eyes of the Desert Sand four stars! I love Spongebob Squarepants! I watch the tv show all the time and I even get to watch it on Netflix too! So I was even more excited to find out I could read about Spongebob too. 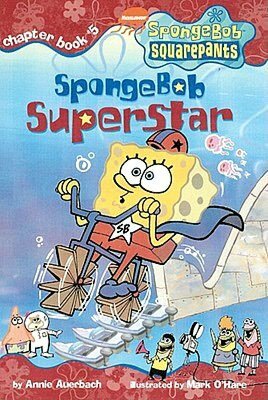 In this book, Spongebob gets to do a whole lot of stunts and it gets put on a T.V. special in Bikini Bottom. He does many things like he paddles with his hands on the water; he also makes krabby patties blindfolded. There are a lot of characters from the show in this book including, Mr. Krabs, Spongebob, Sandy, Squidworth, and of course Patrick. We also get introduced to a new guy named Bailey who is trying to direct the show. Bailey is a sneaky one too! I liked this book a lot especially since I haven't seen an episode for this book yet. I think this book would be great for anyone 7 and up. I am very proud because I read this book all by myself quietly. I hope you can pick up a copy of this for your Spongebob Squarepants library too!